This is the final of 3 reviews that are part of The 3rd Annual Remembering James Horner Blogathon hosted by Becca over at Film Music Central . Tnx for letting me participate! Brief Synopsis – A paranormal expert and his daughter are hired to rid an old house of three devious ghosts and one friendly one. My Take on it – When Becca announced this year’s Horner blogathon, I decided that I wanted to try and watch some of the films that he had scored that I was less familiar with. This is a film based on the famous comic book series that I loved as a kid. They do a nice job of adapting the general story to screen and I especially enjoyed the added touches that give us more background on some of the characters which helps actually “flesh them out” for us. The story itself is a bit far fetched and not believable yet in the context that it is presented in, it actually works. Bill Pullman and Christina Ricci are both great ion the lead roles and Cathy Moriarty and Eric Idle are both deviously enjoyable as the so called “bad guys” in the film. The score by James Horner works really well here to enhance the enjoyment of the story and it adds to the fun as the story begins to unfold before our eyes. Despite being in the early years of VFX and special effects,. they do a wonderful job having the characters interact with one another and it looks quite realistic in that sense. Bottom Line – Really nice adaptation of the popular comic book which gives us more information and background on the main characters. The story itself is a bit far fetched but it still seems to work within the context presented. Pullman and Ricci are both quite good in the leads while Moriarty and Idle are deviously enjoyable as the “bad guys”. The score by Horner helps this film immensely and makes things even more fun to watch unfold. Great special effects work despite the fact that it was just the beginning of the use of these kind of effects. Recommended! 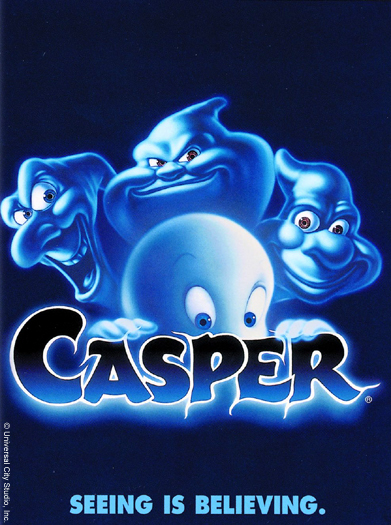 MovieRob’s Favorite Trivia #1 – It’s implicit in the doctor Harvey’s possession scene by the three ghost uncles that the three cameos (Clint Eastwood, Rodney Dangerfield and Mel Gibson) matches to each of the Casper uncles when they were alive (Stretch- Eastwood, Fatso- Dangerfield and Stinkie- Gibson).